Pacifica Deodorant Wipes: These wipes are life savers, I work out over 4x a week and every day after my Muay Thai Class I bathe myself in these. They smell great and are perfect to have in your bag for those sunny days you can't seem to stop sweating. These wipes are part of the PopSugar Must Have June Box. They send you all sorts of goodies every month, deets HERE. Diamond Printed Sarong by Hat Attack: I am so happy with this print, and how its neutral. My style is classic and I love color but not too much on what I wear. So this sarong is perfect for your beach wardrobe. I will be posting on how I wear my sarong this week on my social media. Stay tuned for that! Also, this little beauty is part of the PopSugar Must Have June box too. Born On the 4th Nail Polish from NCLA: Nail Art is very big right now and when I received this in my Must Have Box I opened it and tried it right away. This fun nail polish has some chunky glitter in red and blue. For a simple look paint your nails white and paint this glittery goodness on top for some sparkle. Sensual Strut Body Wash from European Wax Center: Summer is here and the most important part for me is always being ready for the beach. This body wash which is part of the Strut 365 product line from European Wax Center helps with exfoliation, nourish your skin, helps with ingrown hairs and helps to slow down the regrowth of hair. AmorePacific Intensive Serum Masque: Right now, I am all about facials, any cream for my face, masks, whatever it takes to make me have baby skin! This Korean brand has exactly what I want, I took off the mask and right away I had an instant glow. This is perfect to put on before a big event. Dove Bar Soap: For my last beauty product I wanted to share one of my favorite beauty tips. Nothing makes me happier than saving money, I know you guys feel the same. For a cheap and effective way to clean your make up brushes use an unscented Dove Bar Soap. Dove was nice enough to send me some bars so I wanted to give you the scoop on how to clean your make up brushes so you can try it for yourselves Also the Bar is gentle enough to be used as a facial cleanser since its formulated with Dove's signature 1/4 moisturizing cream. It's soft enough for your face and your brushes. 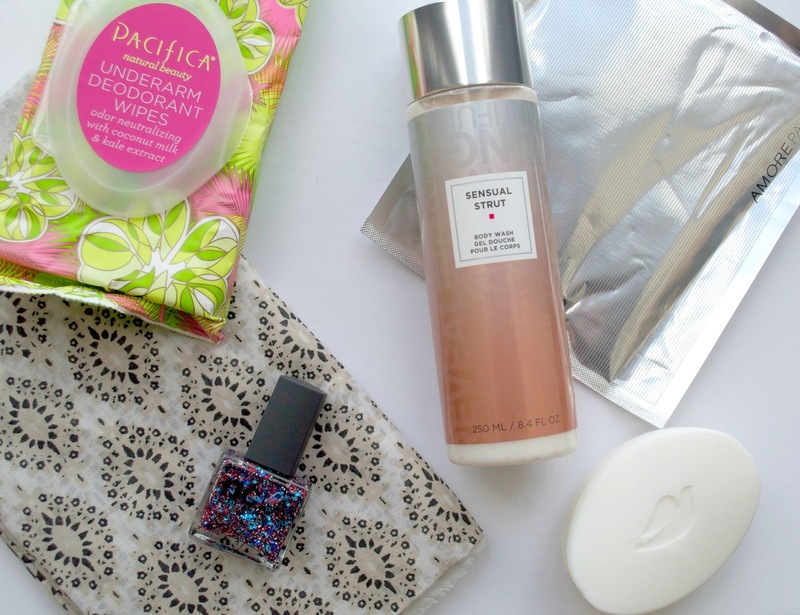 This post was made in partnership with Popsugar Must Have and Dove. As always, all opinions and writing are my own. They sound like awesome products. Deodorant wipes?! What?!!! I need those in my purse asap!